Sanjit is an Investment Director at Intel Capital. He drives investments in Virtual Reality, Augmented Reality, Robotics, Drones, Machine Learning/AI, eCommerce, etc. He has also driven several investments in Big Data, IoT and Cloud Computing. Sanjit has over a decade of Exec leadership experience in Product Design, Business Development and Strategy across several domains: Big Data, Natural Language Processing, 3D Camera/Apps, Supply-Chain Analytics and Flash Memory. He has managed $2Bill/year accounts and executed >30 partnership deals in $100M-$2Bill range. Always ahead of the curve, Sanjit worked on Big Data Analytics before industry created the term ‘Big Data’. Similarly, he launched 2 online courses during grad school in 1999 and published iconic papers on learnings, way before the MOOC revolution started. He’s currently an investor in VokeVR (Live Sports in VR), DocuSign (eSignature), Reflektion (eCommerce), Body Labs (3D Body Modeling), MongoDB (NoSQL Database), Enlighted (IoT), Mirantis (Cloud Computing), GoodData (SaaS BI) and Arcadia Data (Data Analytics 2.0), to name a few. He is currently a Board Member in several startups, including VokeVR, Body Labs, Reflektion and Enlighted. He has had 2 Exits within 1 year of investment with excellent financial returns – Basis Science (Wearables, acq Intel) and Maginatics (Cloud Storage, acq EMC). Sanjit has the fastest Eng PhD from University of Illinois (2yrs 9mo after undergrad), which he received in 2000 with top research awards. He also attended the Venture Capital Executive program at Haas School of Business, UC Berkeley. 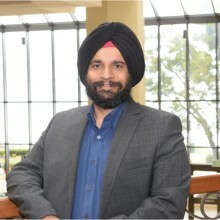 He’s an invited Speaker at several top events, eg SURGE/WebSummit, TiECon, McKinsey leadership event, Silicon Valley Open Doors, Global Big Data and IoT conferences. He’s also a mentor at Stanford and Berkeley’s Entrepreneurship programs. He was also invited by University of California President to join UC Innovation Council this year. He is also helping Indian Prime Minister on how to bring Silicon Valley innovation to India. Personally, Sanjit has an interest in film-making. He has made a few short movies and taken courses in script-writing, lighting, editing and production at DeAnza College, Cupertino.